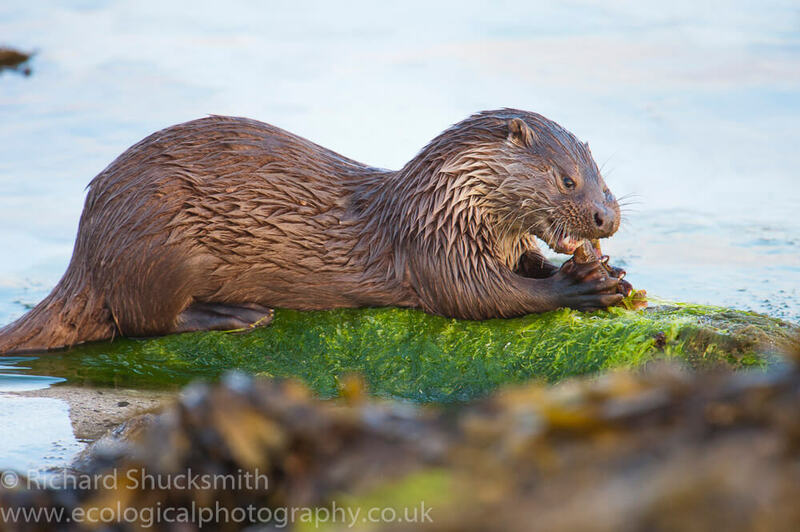 Shetland otters, I have kept a dairy of some of my most memorable days following and photographing otters ever since I have been on Shetland. This is an extract from that dairy. 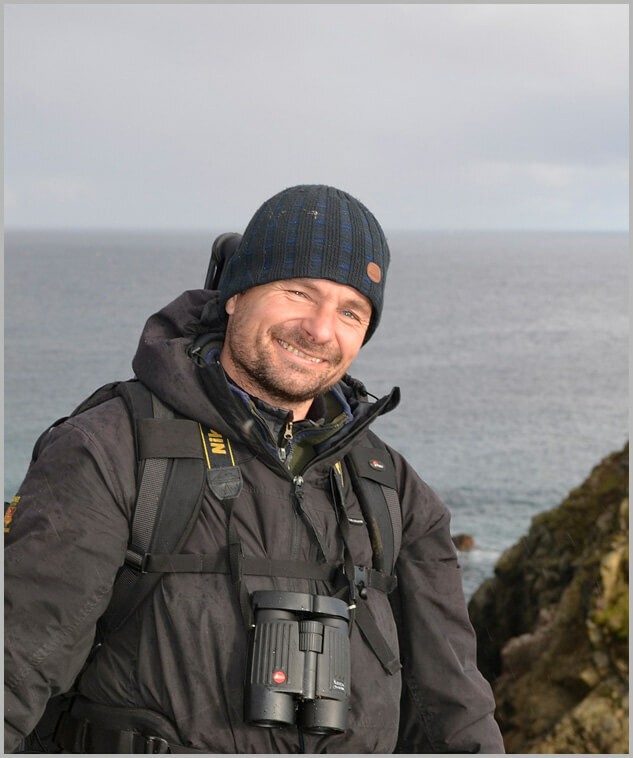 The weather was looking good, so I grabbed the camera gear and headed out to look for some of my favourite Shetland otters. As I walked down the track to the coast, on my left was a sheltered bay and on my right was an exposed bay, where a couple of days ago I found a mother with two cubs. Within a minute of reaching the sheltered bay the familiar tell tale signs were seen, an arched back followed by a tale as an otter dived telling me it was foraging along the shore edge. It was 3:40 in the morning the sun was still a good 15 minutes from rising. The orangey glow in the sky was reflecting in the water, giving it a magical look. I picked up the otter with my binoculars and I could see he was working the kelp bed towards me. I slowly moved into position below the skyline and watched as the otter got closer. This was looking good, not long before the sun rises above the horizon to bath the seascape before my eyes in that lovely orange light, creating depth and atmosphere to the potential image I was dreaming about in my mind. It looked like the single cub that is fully independent of its mother now. He had caught a big scorpion fish and brought it out on to the shore to eat. 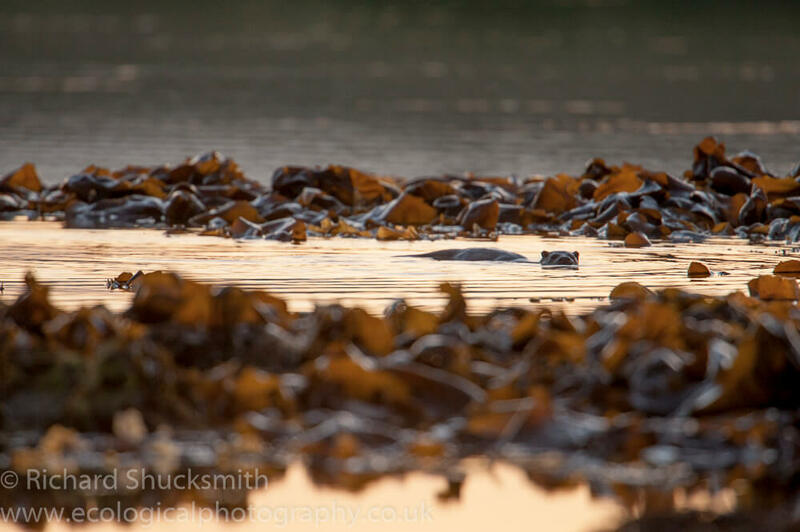 I could see the light hitting the shore just beyond the otter and as the sun peaked over the small hill behind me the light was getting closer and closer to the otter eating his fish. 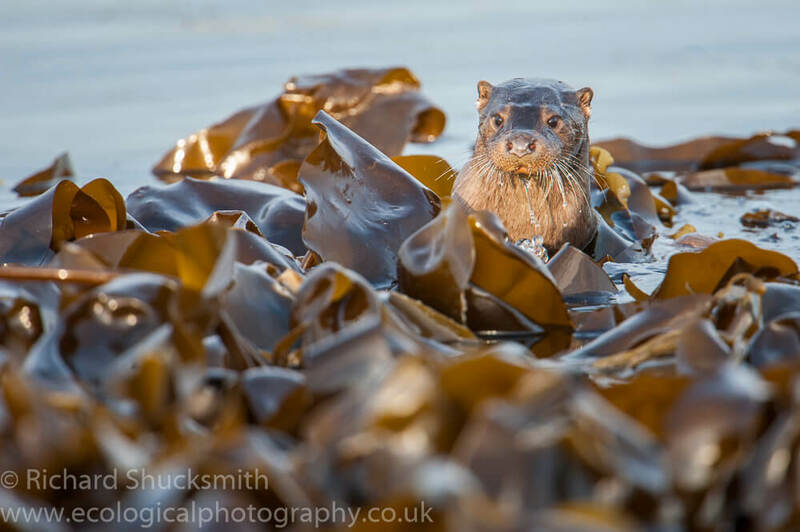 Excitement was building in me as at last I’m in the right place at the right time to capture an otter in that beautiful morning light, which can be difficult to do on Shetland. When I am brought out of my dream world by a thunder of hoof’s behind me. I cautiously look round to see the two local Shetland ponies charging towards me. Fear hits me but not for me, the fact they are going to scare the otter at such a critical moment. I quietly rise up and wave my arms and make some funny noise to stop the ponies but not to scare the otter. It worked and they stopped about five meters behind me, where they stood staring straight at me. I looked at the otter and he was staring at the horses. Suddenly one of the ponies reared up, neighs and runs along the bank. The other one follows, while the otter stares at the Shetland ponies. They run back towards me again, neighing just as the beautiful morning light touches the otter. However, the otter with all this commotion, slips into the water and pops up in the kelp watching the ponies. I watch in disbelief and if only the Shetland ponies would go now, I know the otter would carry on fishing but he is not going to tolerate this for much longer. With that thought, there was a loud neigh; a thundering of hoof’s and the otter disappeared into the kelp bed. Gutted, I cannot believe I had been bamboozled by two Shetland ponies. Feeling very frustrated I carried on to the next bay, cursing the Shetland ponies under my breath. I scanned the shoreline, nothing, and then I heard some whickering. I looked in the direction of the noise when a female and her two cubs appeared from behind some rocks; it looked like the same family from the exposed bay the day before. I dropped below the bank to get off the skyline and watched to see what they did. The two cubs were play fighting in the shallows while mum was successfully catching fish. As mum came in with a fish for the cubs there was strong competition between the two cubs to get the food first. I followed the family for the next couple of hours but never quite getting myself in the right position to get the images I was really after. As always, they were great fun to watch and eventually they curled up on some seaweed and went to sleep. It did not last long and they were off again foraging along a steep rocky coast line before making their way out to a couple of small skerries before disappearing behind an island where I was unable to follow. I watched the bay where I could see the island for while just in case the family started foraging again. An hour or so later a single adult otter appeared, fishing round the end of the island and made its way across the bay to a point. It looked like the mum of the independent cub as she was a lighter brown, a sandier colour. I followed and as she rounded the point, she dived and disappeared. A minute went by and I wondered where she had gone. Then there was an explosion of flapping wings as an adult eider duck flew of the rocks followed by her four chicks. A few second later the otter leapt off the rocks in hot pursuit of the ducklings. Mum eider tried diversionary tactics, that seemed to have worked as it drew the otter away from the chicks to about 15m off the end of the point. Mum eider then did a big circle back to the point and got her chicks out of the water on to the rocks. She then attempted to climb over the point to the other side. 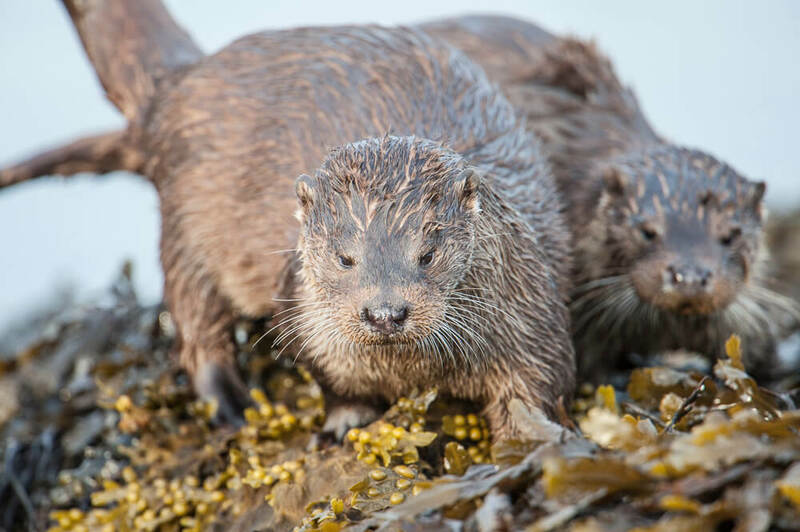 Mean while, the otter realising she had been fooled, started to sneak back round the point to where the eiders were. Mum eider was climbing up a steep rocky slope but the chicks were struggling to get up. Three made it but the fourth one slipped and fell all the way back into the water, just as the otter was coming round the point. Mum eider and her three chicks had made it over the rocks and were back in the water on the other side of the point, to the otter and the lone chick. The lone chick swimming as fast as its little legs would go, was heading round the point towards mum eider but unknowingly heading straight towards the otter. I lost sight of the chick as it disappeared round the end of the point and there was only ever going to be one outcome, so I thought. 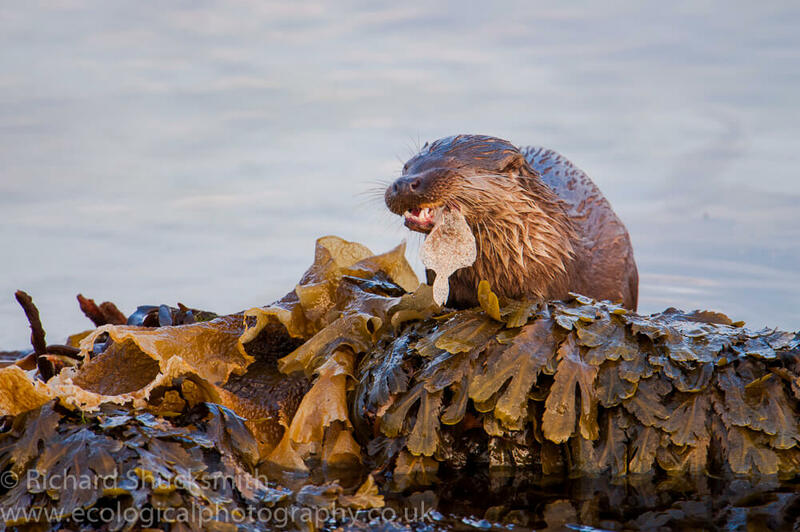 An eider chick snack for the otter! There was a bit of noise of the end of the point and mum eider had stopped looking back to the point and I was amazed to see the little chick scuttling across the water to be reunited with its mum. I was also amused to see a confused looking otter surface having missed its feathery snack. It was an exciting few minutes for me, a terrifying few minutes for the eiders and a confusing few minutes for the otter. I followed the otter for a little longer before losing site of her. 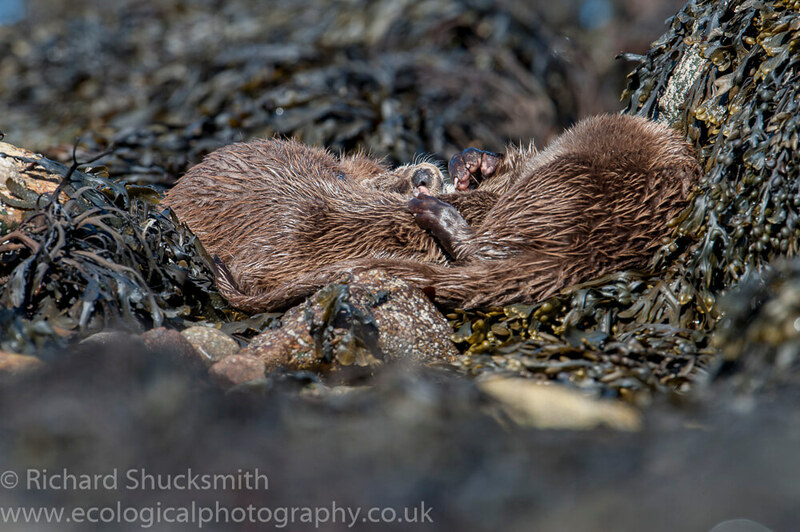 I walked round the bays for another couple of hours but as it was coming on to high tide and it was sleep time for many of the otters after their morning foraging.